Using Contact Improvisation as a warm up and invitation into our bodies, we will then avoid our contact partnering “patterns” to explore other aspects of moving in our sensory bodies—including space, composition, stillness, sensing and relationship to others/environment. With a “performance” mind towards creating dances in space, we will explore our actions as communication with our collaborators, audience and world at large. Each day we will touch-in with “essential images” of contact improvisation including skeletal balance, muscular release, momentum of rising and falling and simple sensory awareness, in solo, duet and larger group modes. To practice composition/performance we will incorporate Tuning Scores (as introduced by Lisa Nelson), which use verbal calls and actions to expose our perceptions to each other during an improvisation. Karen Nelson is a dancer and performer returning to the venue of teaching workshops after living and working for 8 years at a meditation retreat facility-under-construction in rural USA. 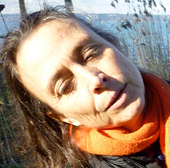 During this time she continued to practice improvisation in performance and research with improvisors in Oregon at Breitenbush Jam and Performance Works North West; at Seattle Festival of Dance Improvisation, SEEDS/Earthdance, and in Europe with Lisa Nelson at L’Imparfait. She now lives on Vashon Island, Washington. Karen’s 34-year dance and performance practice has been directly influenced by Steve Paxton, Nancy Stark Smith and Lisa Nelson and their respective work in Contact Improvisation, Material for the Spine and Tuning Scores, and through collaboration with many others in venues around the world. She co-founded Joint Forces Dance Co, Breitenbush Jam, Dance Ability, Diverse Dance Research Retreat, and the performance group Image Lab among other projects. Image Lab, including Scott Smith, K.J. Holmes, Lisa Nelson and Karen, intensively developed Tuning Scores for nearly a decade in the 1990s. They performed "observatories" in the US, Europe and Asia, spawning other Tuning projects that continue to this day. Karen’s first Contact Improvisation class came in 1976 in the form of a letter from a friend who had drawn stick figures to illustrate counter balance and “small dance”. Later that year she worked with Nancy Stark Smith, Curt Sidall, Steve Paxton, Danny Lepkoff, and Andrew Harwood, (who helped her to finally experience what “giving weight” meant). In the mid- 80’s after years of practice, teaching and performing, questions regarding “what is contact improvisation vs. other improvisation” drove her to detailed study of Steve’s original proposition. Videos edits such at “Chute”, “Soft Pallet”, and “Peripheral Vision” as well as writings published in Contact Quarterly were very supportive. Interest in composition and choreography during improvisation led to a long-time performance practice; collaboration with Lisa Nelson since the mid-80’s has encouraged invention of “senses-based” scores/games for dance making. In 1985 Karen first traveled to Europe and began a period of guest teaching at the New Dance Schools in the The Netherlands and in other communities in Europe including Freiburg.